Salient Features of the National Council (JCM) meeting. 1. The 46th Meeting of the National Council (JCM) was held on 15th May 2010 under the Chairmanship of Shri K. M. Chandrasekhar, Cabinet Secretary. 2. More than 30 representatives of Staff Side and Official Side participated in the meeting. 3. The Chairman stated that although there has been a long gap between the 45th and 46th meeting of the National Council. 4. The Chairman also stated that the meetings of the Standing Committee have also been held quite frequently. • The CCS (Revised Pay) Rules 2008 have been notified vide GSR 622 (E) dated 29th August 2008. • Instructions have been issued vide O.M. No.1/1/2008-IC dated 30th August 2008 regarding fixation of pay and payment of arrears. • Instructions regarding revision / refixation of pension/ family pension have been issued vide O.M. NO. 38/37/08-P&PW dated 1st September 2008. • Instructions regarding revision in the provisions regulating pension/ gratuity/ commutation of pension/family pension/disability pension/ex-gratia lump sum compensation have been issued vide O.M. No.38/37/08-P&PW dated 2nd September 2008. • Instructions / guidelines regarding the Modified Assured Career Progression Scheme (MACP) have been issued vide O.M. No.35034/3/2008-Estt (D) dated 19th May 2009. • Instructions/ guidelines regarding enhancement in the quantum of maternity leave and introduction of Child Care Leave (CCL) to women employees have been issued vide O.M. No.13018/2/2008-Estt. (L) Dated 11th September 2008. • Instructions / guidelines regarding special casual leave to the Central Government Employees with disabilities have been issued vide O.M. No 25011/1/2008-Estt. (A) Dated 19th November 2008. 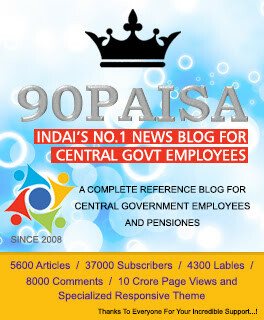 • In addition, most of the allowances of the Central Government Employees have been doubled as per the recommendations of the 6th Central Pay Commission. 6. The Leader, Staff Side Mr.M.Raghavaiah thanked the Chairman for apprising the staff side of the important decisions taken by the Government. 7. Staff Side Leader requested the Official Side to take necessary action to review the CCL from the restrictions. 8. He also stated regarding Children Education Allowance that the original order granting CEA to maximum of eldest two surviving children. This has resulted in problems and in certain cases the administration divisions of some Departments have even started recoveries. He requested that once a decision is taken and implemented, it should be maintained and should not be scuttled or diluted later in order to convey the right kind of message to the employees. 9. He stated that in reality an employee who hitherto got the two financial upgradations in 24 years under the old ACP Scheme, shall now have to wait for three decades to get the same level of upgradations under the new MACP Scheme. 10. He referred to the mismatch in the pay drawn by a senior direct recruit inducted into the service prior to 1st January 2006 and that of a junior direct recruit inducted into service after 1st January 2006 and stated that this is a genuine issue and requested the official side to find out a way to rectify the anomaly. 11. He further stated that normally after every Pay Commission, the Government used to raise the limit of the taxable income. This was not done this time, with the result that even the low paid employees have come within the ambit of the income tax. 12.Thereafter, Secretary, Staff Side Mr.Umraomal Purohit, while making his opening thanked the Chairman and he pointed out that the real problem lies at the level of the Departmental Councils where the meetings have been held regularly in a very few Ministries / Departments. 13. Thereafter, Secretary, Staff Side referred to the 16 pending awards of the Board of Arbitration and stated that these awards have not been implemented by the Government and there is a need to discuss them once again with the staff side. He further stated that it is the right time for a comprehensive review of the JCM Scheme and suggested that a High Level Joint Committee may be constituted for this purpose. 14. Secretary then appreciated the job done by the Fast Track Committee (FTC) and stated that despite the clear cut recommendation of the FTC regarding the Master Crafts Man, the same is yet to be implemented by the Ministry of Defence. 15. Non-matriculate class IV employees who retired or died between January 2006 and August 2008 without any re-training had also been deprived of the benefit of pay fixation in PB-I. The Chairman stated that the pending awards of the Board of Arbitration would be reviewed. Regarding the suggestion to constitute a high level committee to review the JCM Scheme, the Chairman stated the matter may initially be discussed by the Secretary, DOP&T with the Staff Side and then if needed, a committee could be constituted. Secretary, Department of Pension and Pensioners’ Welfare assured the staff side that the matter will be reviewed in consultation with the Central Pension Accounts Office, Controller General of Accounts and Controller General of Defence Accounts and a deadline will be fixed for issuance of the revised PPOs. The official side stated that the concept of FMA will have greater chances of success once the health insurance scheme is implemented. The guidelines of the proposed Health Insurance Scheme Central Government Employees and Pensioners have been shared with the staff side where OPD is taken care of through FMA and for indoor treatment an insurance cover of Rs. Five lakhs is available to the beneficiaries. The matter will be further examined by the Ministry of Health and Family Welfare in consultation with the Ministry of Finance. 7. SUBJECT: SUPPLY OF FREE DIET TO EMPLOYEES AND THEIR DEPENDANT UNDER TREATMENT FOR TB, LEPROSY, MENTAL ILLNESS, CANCER AND HIV/AIDS, RENAL DIALYSIS THERAPY, THALSAEMA. After a prolonged discussion, it was decided that the official side will re- examine the matter. 9. SUBJECT: DECLARATION OF GANDHINAGAR AS LINK – CITY OF AHMEDABAD. In view of the prolonged demand of the Staff Side, the Chairman agreed to re-examine the matter. 10. SUBJECT: UPGRADATION OF JAMNAGAR AS B-2 TOWN WITH EFFECT FROM 20.07.2006. The Chairman stated that there was merit in the arguments put forward by the staff side and directed the Department of Expenditure to re-examine the matter. The official side agreed to re-examine the matter. 13. SUBJECT: ELIGIBILITY OF FAMILY PENSION TO WIDOW/DIVORCE DAUGHTER/UN-MARRIED DAUGHTER WHO ARE NOW ELIGIBLE FOR PAYMENT OF FAMILY PENSION FOR INCLUSION OF NAMES IN PPOs ISSUED MUCH EARLIER. The Chairman agreed to examine the suggestion of the Staff Side. 18. SUBJECT: CASUAL LABOURERS (GRANT OF TEMPORARY STATUS & REGULARIZATION) SCHEME – NON IMPLEMENTATION OF. The Chairman intervened and stated that if the Staff Side had any legal point on this aspect, then the same may be forwarded to the Department of Personnel & Training for examination. The Official Side agreed to re-consider the matter relating to grant of two days restricted holidays to employees of industrial establishments. The Chairman decided that the matter will have to be examined by the Ministry of Defence, in consultation with the Ministry of Law and Department of Personnel & Training. Term Fee is also chaging by School I-card, Dairy, Circular etc. Fee is also charging by school which is also not re-imburseing by the Office. Kindly take n.a for re-imburseing all fees charging by the Schools. chairman sir pl discuss the matter regarding toype D alottment rule it should be on GP 5400 instead of 6600.